ART DESIGN INTERNATIONAL TOP DESIGNER OFFICE STOOL | ADI | Alliance Interiors Inc. The TOP Low Back stool is available in a variety of regular and recycled fabrics, PVC free synthetic leather or in vinyl. It is offered with a fixed or adjustable backrest and several models of fixed or adjustable arms (height/width, pivoting, retractable). The stool is offered with a swivel mechanism or a ergonomic multi-adjustable mechanism mounted on a 8 or 10 in gas cylinder. It is equipped with a height adjustable circular footrest. This stool offers the comfort of a fully adjustable ergonomic chair while providing comfort to a specific group of users who need to work at a higher work surface. I have put the ADI “Top” office stools in laboratories, police stations, hospitals, drive thru areas, nursing stations, box offices, repair shops, waiting areas in car dealerships where customers are sitting at counter height to use their laptop , drafting tables ,designers, engineers etc. The flexibility of the areas it is used in is unlimited. The ADI “Top office stool is made of 100% recycled steel and the back and seat cushions are replaceable. 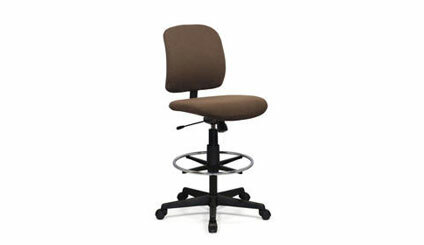 The unique suspension system on the seat distributes the users body weight and provides ergonomic back support to keep the individual comfortable while working for long periods of time.